Specially designed computer software is revolutionizing procedures for structured or rational drug design and discovery. The Guidebook on Molecular Modeling in Drug Design serves as a manual for the analysis ofmolecular structure and the correlation of these structures with pharmacological reactions. Intended as an introductory guide for advanced students and professionals with an interest in computer-assisted modeling for drug design and discovery, this bookwill also be of interest to medicinal and organic chemists, pharmaceutical researchers, pharmacologists, and biochemists who want to gain further insight into this rapidly advancing field. Molecular modeling is assuming an important role in the understanding of three-dimensional aspects in the specificity of drug-receptor interactions at the molecular level. This research area has become a well-established discipline in pharmaceutical research. It has created unprecedented opportunities in assisting medicinal chemists in the design of new therapeutic agents. Advances made in computer hardware and in theoretical medicinal chemistry have brought high-performance computing and graphics tools within reach of most academic and industrial laboratories, facilitating the development of useful approaches to rational drug design. The Guidebook on Molecular Modeling in Drug Design serves as a manual for the analysis of the molecular structure of biological molecules and drugs and the correlation of these structures with pharmacological actions. Intended as a guide for advanced students and professionals with an interest in computer-assisted modeling for drug design and discovery, this book will also be of interest to medicinal and organic chemists, pharmaceutical researchers, pharmacologists, and biochemists who want to gain further insight into this rapidly advancing field. Medicinal chemists, organic chemists, pharmaceutical researchers, pharmacologists, and biochemists. N.C. Cohen, Preface. 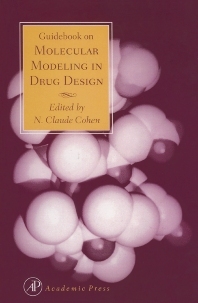 N.C. Cohen, The Molecular Modeling Perspective in Drug Design. R.E. Hubbard, Molecular Graphics and Modeling: The Tools of the Trade. T. Gund, Molecular Modeling of Small Molecules.A. Itai, M.Y. Mitzutani, and Y. Nishibata, Computer-Assisted New-Lead Design. J. Priestle and G. Paris, Experimental Techniques and Data Banks. P. Gund, G. Maggiora, and J.P. Snyder, Computer-Assisted Drug Discovery. M. Clare, S. Rao,and J.P. Snyder, Modeling Drug-Receptor Interactions. J.P. Tollenaere, Glossary of Terminology. Index. Synergix Drug Design Company, Jerusalem, Israel.